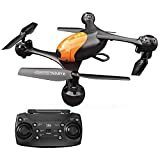 Best Eachine Drones 2019 – reviews of the top eachine drones for sale in 2019. Find out which Eachine Brand drones are best. Featuring Eachine E58, E010 and more. This foldable drone measures 12.5×7.5x5cm when folded, and weighs about 96 grams. The drone features a detachable motor design, which makes it relatively easy to replace any of the drone’s arms or motors. What’s more, you can fly it with either a smart device or a Wi-Fi-enabled remote controller. The drone has an operating range of 80 to 100 meters, but its Wi-Fi operating range is limited to about 30 meters. At the same time, its LiPo battery, which takes about an hour to charge fully, offers a flight time of 7 to 9 minutes. 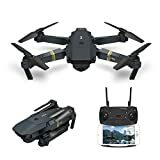 Some of the drone’s notable features include, among others, a 720p camera, first-person view capability, App control, altitude hold mode, three speed levels, 3D Flip Mode, and one key takeoff and landing. You can purchase the Eachine E58 WIFI FPV on Amazon today for about $77. Designed to look like a miniature version of the DJI Mavic Pro, the Eachine E58 is a small foldable and compact quadcopter aimed at people with little-to-no drone flying experience. With the battery installed, it weighs about 360 grams. While the E58 does not offer the same premium features found on the DJI Mavic Pro, it does offer all the features you would expect to find in an entry-level Wi-Fi FPV quadcopter. The Eachine E58 is available in two versions. The base version features a 0.3 megapixel camera while the improved version features a 2-megapixel camera with a wide-angle lens (120 degrees) that shoots 720p high definition videos. The drone’s key features include, among others, Headless mode, Altitude Hold mode, one-key return and WiFi FPV system that allows for live video stream from the drone’s camera to your smart device. In terms of the batteary package, it comes with a a 3.7V 500mAh capacity LiPo battery that delivers seven to nine minutes of flight time. Additionally, the drone comes with a dedicated DJI-inspired remote controller that is limited to about 100 meters. At the same time, the drone’s FPV Wi-Fi range is limited to about 30 meters. 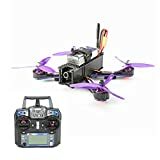 The Eachine E58 is available on Amazon for about $93. Measuring 3.7 X 3.7 X 2 inches, the Eachine E010 belongs to a category of drones called mini drones. It is essentially a beginner drone specifically designed for indoors flying. Although it does not come with a camera, it offers a fun and engaging flying experience. However, you can mount a camera to the drone to enjoy FPV experience. Its crash- friendly propeller guards and ducted propeller design make the drone quieter, durable, safer to fly indoors and more efficient. Its key features and specifications include, among others, 360° roll-over button and one-key return feature for auto-location. It has a 7V 150mAh battery with 45 minutes charging time. The battery delivers 5 minutes of flight time. 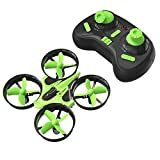 The Eachine E010 currently costs $22.99 on Amazon. •Manufactures offers a wide range of accessories including more powerful batteries and cameras. Featuring a ducted design, the Eachine E014 Windmill is a super stable quadcopter that comes with a 1-megapixel Wi-Fi FPV camera that records 720p videos at 25fps. The quadcopter measures 3.5x3x1.2 inches and weighs just 34 grams, meaning it is highly portable. You can fly this little drone with either its dedicated remote controller or your smart device. For better precision, the drone comes with smartphone joystick controllers. In addition to its safe design, the Eachine E014 Windmill packs many useful features including a pinpoint position with optical flow technology, gravity sensor, flight path support, one-key take off /landing, and auto-hovering, among others. The drone comes with several in-built automatic flight modes including Hold Mode, Gesture-Sensing, Throw&Go Mode, Headless mode and Trimming. On the safety front, if you flip it upside down, it will shut off to avoid burning out its motors. The drone’s battery pack consists of 1S/300mAh/3.7V non-removable battery that delivers about 5 minutes of flight time without recharging. Although it takes about 30 minutes to charge the battery completely, you cannot fly the drone while the battery is charging. The drone’s operating range and maximum altitude are 20 meters and 4 meters, respectively. You can purchase the Eachine E014 Windmill today on Amazon for about $40. Light streamline design and incredible power for fantastic acceleration and lift. There is a Led Indicator in the front and in the back that can let you fly at night. Equipped with new powerful new MN2205 2300KV motors, this is a wickedly fast and nimble racing drone. Some of the drone’s notable design elements include an ultralight carbon fiber frame, a three-blade propeller system and an X frame design. Combined, these design elements greatly enhance the drone’s flight capabilities, allowing it to fly even in rough weather conditions. What’s more, the drone’s essential parts, including the video transmitter and camera are well protected, reducing the risk of expensive repairs or replacements. The Eachine Wizard X220 is available two versions: ARF (almost ready to fly) and RTF (ready to fly). One of the drone’s standout features is its camera. Specifically, the Eachine Wizard X220 comes with a front-mounted 700TVL camera with a wide field of vision. Additionally, the drone comes with an action camera mount, meaning you can attach a GoPro or any other action camera to your drone. This quadcopter comes with a 2.4GHz FS-i6 6-channel remote controller that you can program to fly multiple racing drones. 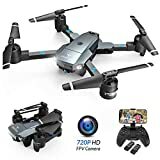 The Eachine Wizard X220 currently costs about $210 on Amazon. Thanks to the Eachine E010C, you do not necessary need to convert your Eachine E010 into an FPV quadcopter. Simply put, the Eachine E010C is the FPV version of the Eachine E010 quadcopter. 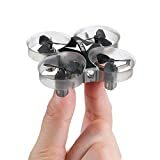 The drone costs about $37 on Amazon, making it signficantly less expensive than the Inductrix FPV and MakerFire Micro, which cost about $200 and $65, respectively. In terms of its flight capabilities, its tiny size and lightweight design combine to offer a great indoor flying experience despite the addition of 25mW 40-channel CMOS camera. Speaking of the camera, it is an 800TVL model that is compatible with virtually all FPV goggles or 5.8G displays. Being an indoor-only drone, it a short flight time as well as a short operating range. The drone comes with a 1S 150mAh battery that delivers about 5 minutes of flight time. Unfortunately, the E010C still uses the same controller as the E010, which limits the drone’s capabilities. Fortunately, you can use a professional quality transmitter, such as the Devo 7 transmitter to operate the Eachine E010C, allowing you to enhance your flying experience greatly. Ultrafast flight speed easily manipulated.Long distance remote control high sensitivity. Enjoy ignoring crossing barriers.Support 4S Lipo battery . Equipped with 2204 2300KV brushless motors and featuring a carbon fiber frame, the Eachine Racer 250 is an extremely fast racing drone that weighs only 400 grams without its battery pack. The drone comes with a powerful 1000TVL FPV camera, CC3D flight controller and 1500mAh battery, which offers about 15 minutes of flight time. It is worth noting that you can configure the flight board CC3D through a software called Open Pilot GCS, which comes with the quadcopter. Open Pilot GCS is compatible with Mac, PC, Mac as well as Linux. Some of the drone’s key features include in-built OSD, real-time video transmission and Snowflakes Screen. For night operations, the drone comes with 3W white LED lights. Eachine manufactures different types of drone, ranging from hobby drones to racing drones. Additionally, Eachine offers different types of drone kits including ready to fly (RTF), almost ready to fly (ARF) and bind-and-fly (BNF) kits. An RTF kit means the drone comes with all the accessories it needs to fly. An ARF kit means the drone comes unassembled, meaning this kit is aimed at DIY enthusiasts. Finally, a BNF kit means the drone comes with all the accessories it requires to fly except a transmitter. 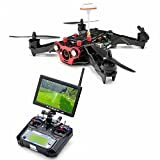 •	Price – Eachine drones range in price considerable depending on factors including size, quality of materials and features. Of course, the more expensive drones offer more features as well as longer operating range and flight time. •	Camera – If you are buying a drone for photography or videography purposes, ensure it has a decent on-board camera or an action camera mount. When it comes to camera, consider factors such as imagine stabilization technology, FPV system, frames per second, angle of view and digital media storage options. •	Control option – Depending on the make and model of the drone you choose, you can control it either with a dedicated remote controller or with your smart device. However, it is important to note that not all Eachine drone allow for smart device control. To put it another way, you should choose a drone with a control scheme that appeals to you. •	Battery – Some drones come with removable batteries while others come with non-removable battery. At the same time, battery life and charging times vary across the board. Ideally, you should choose a battery with a high milliamp because it will last longer between charges. •	In-built flight modes – Eachine drones typically come with in-built automatic flight modes designed to make flying easier for inexperienced pilots and fun for experienced pilots. For instance, the Headless mode would allow you to fly without worrying which direction your drone is facing. On the other hand, the one-key return function would allow you to find your drone easily in case you lose it. Compared to most of its competitors, Eachine produces high quality drones at a lower price point. 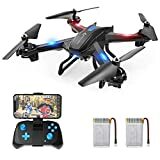 For example, while the Eachine E010C costs $37 on Amazon, similar quadcopters such as the Inductrix FPV and MakerFire Micro costs significantly much more. The Eachine brand is renowned for producing high quality budget drones. Some of the brand’s most popular quadcopters include the Eachine E58 WIFI FPV, Eachine E58, Eachine E010, Eachine E014 Windmill, Eachine Wizard X220, Eachine E010C RTF and Eachine Racer 250. With that exception of the Racer 250, all these drones are available on Amazon for less than $100. Despite their relatively low price tags, Eachine quadcopters come with all the features you would expect to find in entry-level drones, as well as some features you would expect to find in premium drones.